After all the sweets and rich cooking of the holidays, we particularly welcome clear, bright vegetable flavors. 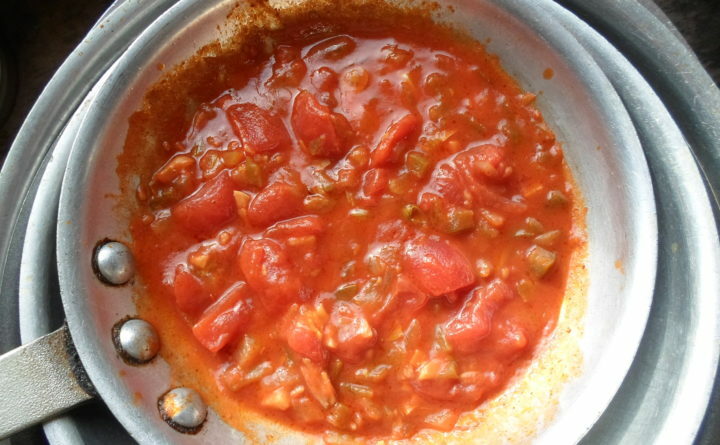 And pretty wonderful things happen when you cook up onion, green pepper and celery all together then add garlic, tomatoes and tomato sauce, the whole thing seasoned to taste with red pepper or Tabasco sauce. You can add shrimp, chicken, scallops, sausage or beans to the vegetable mix for a terrific one-pot dinner to serve over cooked rice. For us in Maine, it is like a meal-long trip to New Orleans. Peppers, onions and celery are called the holy trinity of Creole cooking. A similar collection of vegetables — onions, celery and carrots — is called mirepoix in French cooking and soffritto in Italian, and is another good way to start a stewed dish, pasta sauce or soup. These combinations add flavor to dishes when they are sautéed in butter or olive oil before you add the rest of the ingredients. In fact, I have seen, but do not remember where or when, a pre-made version of mirepoix all chopped up, mixed and ready to empty into a pan as needed. It was probably in a specialty foods store. You could do it for yourself, if you anticipate a spell of cooking ahead. In this recipe, the three vegetables are used in equal proportions. With mirepoix and soffritto the convention is to use twice as much onion as celery and carrots. How much red pepper, cayenne or hot sauce is absolutely a matter of taste. I think the sauce is lovely without much spice. It’s a good way to turn cauliflower, artichokes or mushrooms into something special. Even poaching an egg served with it in the manner of huevos rancheros works. What a good breakfast or brunch that would make especially if you added a little cooked sausage. A cup of Creole sauce with a generous quantity of shredded cheddar or Monterey Jack cheese melted makes a good dip for corn chips. The recipe works with canned tomatoes and canned sauce, either your own home canned or the store bought variety. Round the quantity up or down to the nearest size can. The directions that follow will work with two pounds of shrimp, three or four andouille sausages, or a whole head of cauliflower. Don’t forget the rice. Add the red pepper or hot sauce as you use it, so that you have maximum flexibility when you decide what other ingredients to add. You can add raw whole shrimp to the sauce as soon as it is made, or partly cook cubes of chicken, cauliflower or slices of sausage before adding them to the sauce. I divided up the recipe and froze some to thaw on a cold winter day when my taste buds need a wake-up call. P.S. My apologies, again, for omitting the cheese in the cheese balls recipe last week. If you did not catch the correction in the print paper or online, make note that you need one pound of shredded cheese. Thanks for getting in touch by email to ask about the missing ingredient. It was actually great to hear from so many of you, and good to know you find the recipes here are useful. I calculated that if everyone who got in touch this past week each made a full batch of cheese balls for parties this weekend and New Year’s Eve, then close to 1900 cheese balls were concocted in Down East Maine in the past couple of days. 1. In a heavy saucepan, melt the butter and heat the olive oil until it all bubbles. 2. Add the onion, pepper, celery and garlic, and cook over a medium heat until the vegetables are tender, about 5 minutes. 3. Add the tomatoes, tomato sauce, and the chili powder and/or red pepper flakes to taste. 4. Simmer all together for about 10 minutes, taste and adjust seasonings. 5. Sauce is ready to use.